The rimfire calibers have been in my thoughts lately, due to seeing some long range Conejo in Spain and being frustrated in my stalking of shorter range Bunnies here in ol' Blighty. 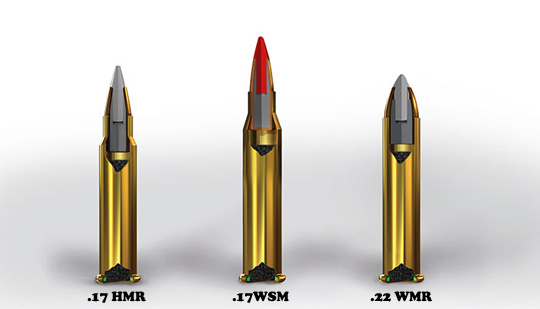 With the rising cost of ammo a reality everywhere Winchester have pulled what may prove to be a game-changer out of the hat. The .17 WSM. Winchester may be best known for ammunition [sadly also knives and flashlights of dubious distinction] but they long ago diversified into 'powered fasteners' AKA 'Nail Guns' which happily gave the Recessionista's at their R&D lab an already up-and-running production facility for larger cased rimfire ammunition! Launching a 20-grain pill at 3,000 fps, or a 25-grain one at 2,600 fps with energy at the 400 foot-pounds and 375 foot-pound mark. That's 150 pounds more than the 17 HMR and 60 foot pounds more than the phattest .22 Winchester Magnum load. Some pundits are claiming that when it comes to wind drift and drop, the .17 Win. Super Mag. will beat the .17HMR by 50%, and leave the wind-challenged .22 Win. Mag. flapping about in the breeze. "No honey I'm not 'spending' money I'm SAVING money, I'm a Recessionista"
Centrefire effects for rimfire prices? Sounds good to me.Whacha reckon? I've always hated that 'coming home from holiday' feeling, so when my plane landed at Gatwick, (or Gay Wick as the spell checker on my phone calls it) I thought I'd use the opportunity to soften my landing by going rabbit hunting on the way home.McShug lives fairly near the airport, he and I have been trying to catch up for what must be about a year now. We've beaten Pheasants and Stalked Fallow deer together, but this time we're going for the most 'english' of shooting on the most english of 'permissions'. Majestic 'Thetford Red' Stags on Lord Pushbarrow-Handcart's estate? Woodland stalking Roe Bucks with a David Lloyd .240's? 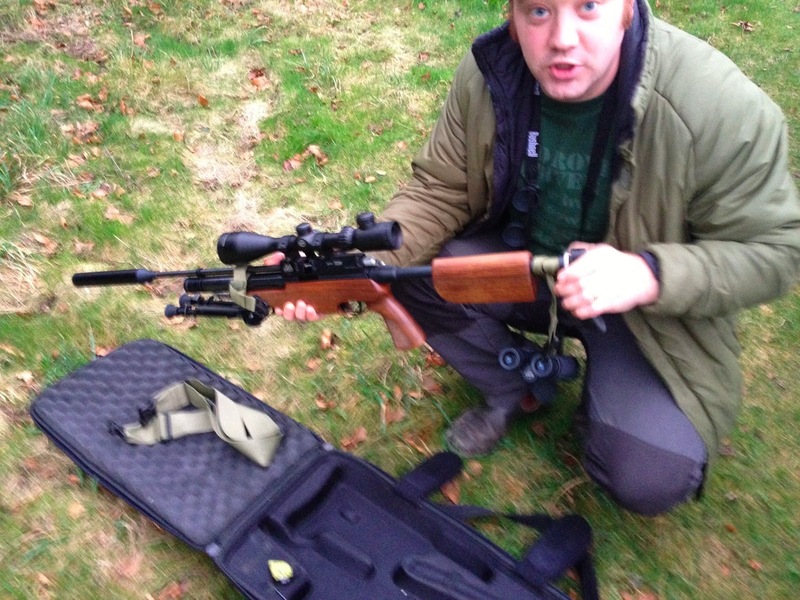 Sniping Muntjac from a golf course with a moderated .223? Parkland Fallow with a .275 Rigby? This time it's Rabbits with a sub 12ftlbs air rifle on the village cricket pitch! How English is that? There are loads of ways to take bunnies, James and I used Ferrets, but this is the way generations of English boys have honed their riflery and filled the pot. The ground is small but perfectly formed, lovely mown grass to entice the bunnies and hedgerow on all four sides for them to burrow under, with big open fields on all sides. Perfect. We drive on to the rough stuff outside the oval and start setting up and glassing the hunting ground. 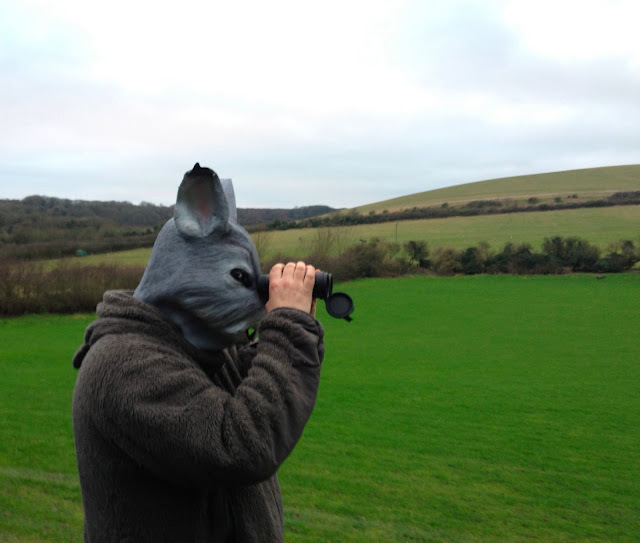 Straight away there are two rabbits in a stalk-able position about 150 yards away, a little more glassing the hedgerow and we sight another only 50 yards away and in an even better position! As we take the first tentative steps, there's a rustle in the hedgerow and a chump walking a dog blows it for us! That 17HMR is starting to look like a good idea, but this is Rabbit hunting rather than rabbit shooting - the stalk to within 35 yards is the name of the game, sadly some vegetarianism sometimes comes into it. We breach the fence and getting on to the foot path that runs down one side of the oval make the trip round the outside of the permission, but by the time we're starting to stalk back the light goes and we head for the pub. Somewhere in my gear pile I have a gun mountable flashlight so next time Mr Bunny, next time. 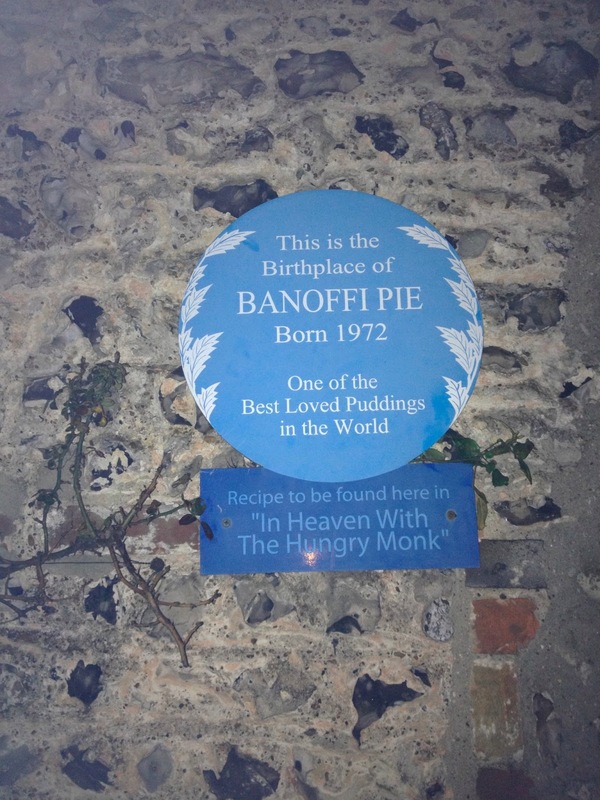 On the drive to the pub where we pass though the flint villages of East Sussex. Where the chocolate-box cottages are built from 'faced' flint and McShug drops a most excellent local history fact. We pass, the now sadly closed, Hungry Monk restaurant that was the birthplace of the Banoffi Pie. Not something you see every day. No rabbits were harmed during the writing of this blog post. Bah! PS Air Arms make some very sweet rifles, and are the UK seller of the S200 which is made with CZ and available in the US as the CZ S200. Very sweet especially for the price. Myself and the BLF (bloody lady foreigner) have been in spain for the past few days visiting her folks for Navidad and Año Nuevo. It's been a lot of fun being brand-new, stuffing my face with all kinds of delicious pork products and trying to learn to speak Spanish. There hangs a tale: I've been learning my Spanish from BLF (bloody lady foreigner), which has weighted my vocabulary in 'certain directions' as she swears for the Spanish national team. One afternoon having eaten all kinds of wonderful things she suggests we walk off a few calories with a visit to the Armeria. I'm fascinated by gun shops and the strange nonsense you hear from characters on both sides of the counter. 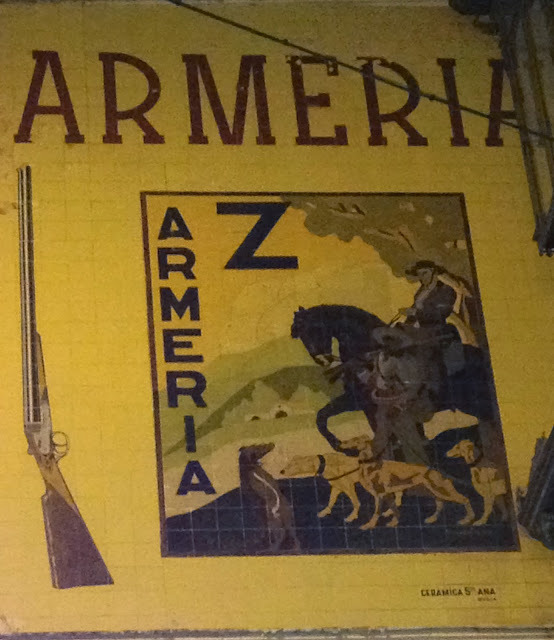 Gun shops are also the first port of call to learn about the local hunting culture, and as so much about hunting is numerical or made up of familier concepts, it could also be the chance to practice my Spanish, so we wander down there. Gun Shops the world over all follow certain themes, and they are also a window into the local conditions and traditions. In Alicante the clothes are a bit lighter for the rainless plains of Spain, the locals favor a lightweight boot over our warm and waterproof boots but mostly its the same kind of stuff you'd see in your local gun shop from London to Loudon county. Unlike the green north this Spain is a land of long dry plains and dusty jagged ridge lines - only just greener than the set of a spagetti western. Hunting here takes place over large distances; running Hares down with rapid longdogs called Galgo, an extencive tradition of Falconry, they are serious about hunting conejo (rabbits) but the real obsession is the Red-Legged Partridge, or 'Perdiz'. The rich guys use the same driven game tactics as in the UK, the country folk or 'campesino' hunt them over dogs during very long walks. To reduce the distances walked, and as Partridges can't be eaten after they've been shot with a high velocity rifle, the locals hunt them in a style of hunting I'd not seen before. If you can't get to the prey, you must get the prey to come to you. The armeria stocks the kit for 'Reclamo'; hanging above the counter were several models of 'Reclamo' a sort-of 'Judas Trap' for Partridges. The plan is to capture or breed a mature male bird, house him in a portable birdhouse, which you can take to the hunting ground and have him call the girls to your waiting gun. Saves on all that walking. By the time all this had been explained to me the BLF's patience with being my personal google translate was wearing a little thin, so I resorted to talking cartridge choices with the shopkeep. Pretty easy in any language, numbers are numbers, Remington and Winchester are the same in any language, even for people who are in the habit of adding or missing out vowels from words. I dont know my letters yet so I wrote on the back of a business card, remembering to start the question with the upside down question mark, enquiring after the whereabouts of the bunny-whacker of choice the 17HMR, "22 minimum" came the reply to which I thought I said "that's unfortunate in England we use them to hunt rabbits" Elfa and the gun shop guys blushing faces told me I'd actually missed out the 'e' and said "that's unfortunate in England we use them to hunt c***o" which sounds similar-ish, but means something very different.